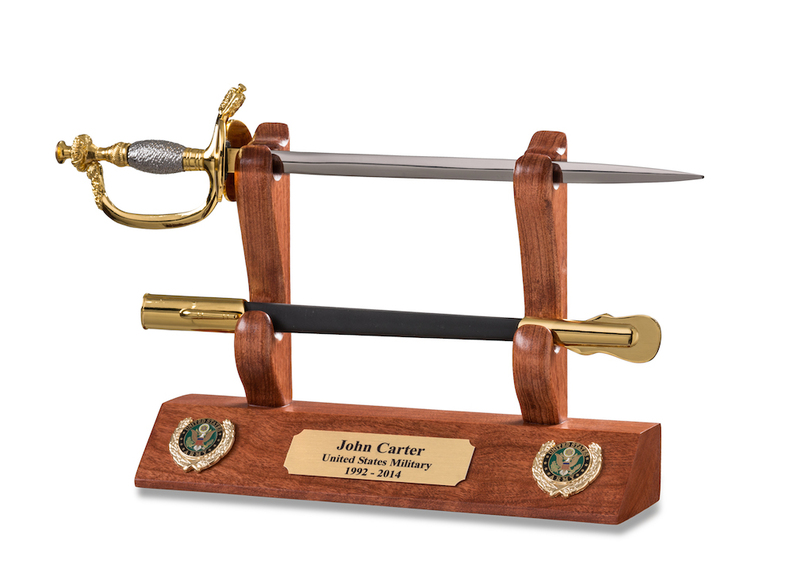 Open your letters in style using our Army NCO Letter Opener and Display. Crafted from premium wooden materials including Northeastern American Cherry and Appalachian Black Walnut, this 11” display fit for your office table will also serve as a great accent and a great conversation starter. Each sword that is fitted into the display is a replica of the swords used by officers in the US Marine Corps, US Army, the US Navy and the US Air Force. Each display will also feature additional accents which you can have for a minimal price. You can add wings, military units, vehicles, ships or insignia into the display. We add these accents based on availability. We also offer text engraving so you can customize this functional letter opener and display. You can add your name and position to show ownership. We charge $20 for the first line, and an additional line will cost $2.